Idemitsu Kosan Co., Ltd. (Idemitsu) is a leading producer and distributor of oil, lubricants, and petrochemical products, and is also engaged in the research and development of functional and electronic materials as well as agricultural biochemicals. At the company's Technology & Engineering Center, technical experts are carrying out research in the refining and petrochemical fields, focusing on topics related to development, design, construction, operation, quality control, maintenance, and systems. 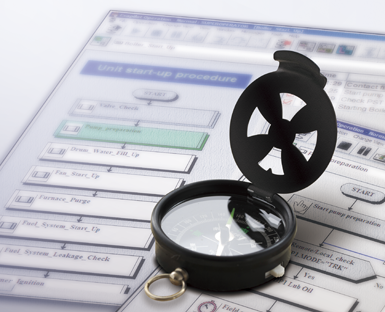 They provide technical supports that ensure safe and stable operations and enhance the competitiveness of processes. They also assist in the development of processes for manufacturing new functional chemicals and in licensing for the export of process and catalyst technologies. 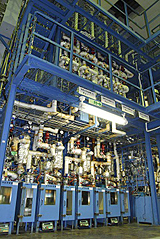 At this center's bench plant, Idemitsu is using Yokogawa's Exapilot operation efficiency improvement package in experiments involving catalysts that are used in refinery hydrogenation and hydrocracking units which play important roles in determining the qualities of the refined products. To optimize such a catalytic reaction, candidate catalysts are evaluated in the bench plant under various temperatures and pressure levels. 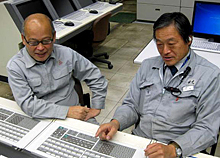 Idemitsu has been using the Yokogawa CENTUM distributed control system at this bench plant. 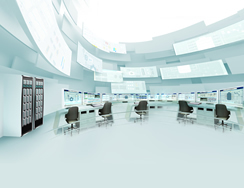 On the other hand, they are also already familiar with the benefits of Exapilot used elsewhere in their organization. To improve operations and achieve the same benefits at this very complex bench plant facility, they decided to introduce Exapilot here as well. The bench plant startup and shutdown procedures for these experiments are complex, and they must be carried out repeatedly, placing great demands on the operators. The Exapilot system draws on the expertise of experienced personnel to provide cues that navigate operators step by step through each procedure. Thanks to the use of Exapilot to set temperature gradients and alarm thresholds, the operation of the units throughout this plant is smoother and more uniform, resulting in improved safety. 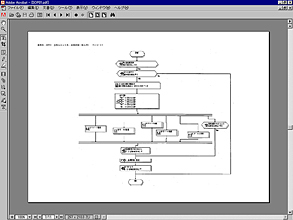 Flowcharts created with Exapilot facilitate a greater understanding of the operation procedures. Idemitsu anticipates that this will allow its more junior personnel to operate this plant more effectively. Each experiment requires different parameter settings. Before the introduction of Exapilot, operators needed to manually enter data based on the information specified in a hard copy experiment plan submitted by the department that was requesting the experiment. Now operators receive an Excel document that can be used to automatically enter the data to the DCS in a single operation, and the operators only need to confirm the parameter settings. Excel reports can also be sent back to the requesting department, speeding up the overall process and ensuring greater accuracy. Based on the results achieved so far, Idemitsu expects that it will be able to achieve a 2,000 hour reduction in work hours by introducing Exapilot throughout this experimental facility. And to make more effective use of assets such as process gas chromatographs that are shared by more than one unit, the plan is to import the test schedule to Exapilot and automatically reflect this in the operating plan. Our feedback from Idemitsu indicates that they have found Exapilot to be an effective tool in improving work efficiency. They appreciate the ability to create a flowchart that guides them in streamlining and optimizing an operation. They would like to see Exapilot enter wide use so that their operators can accumulate know-how and solve operational issues on their own. While still evaluating the use of Exapilot at their experimental facility, they do recognize that it has had the desired effect, and would like to extend the scope of its application and obtain further benefits.